The murder of Trayvon Martin was the beginning of the Black Lives Matter movement that accelerated with the death of Michael Brown in Ferguson, MO and has grown with the deaths of so many other blacks at the hands of police. #TrayvonTaughtMe digital toolkit and campaign:The #TrayvonTaughtMe digital campaign highlights the beginnings of the Black Lives Matter movement, and how Trayvon’s extrajudicial murder and his family’s commitment to ending gun violence and strengthening communities catalyzed a generation of organizers and activists to take action for Black lives. Five years later, the same conditions that led to Trayvon’s death have been exacerbated under the Trump administration. Anti-Blackness is pervasive and implicit, and Black children and adults continue to be put on trial for our own murders. The perceptions of Black people and Blackness in America, and globally, have resulted in the refusal to acknowledge the unique cultural contributions of Black people. Moreover, they perpetuate prejudice, deadly policing, racist legislation, and interpersonal violence. 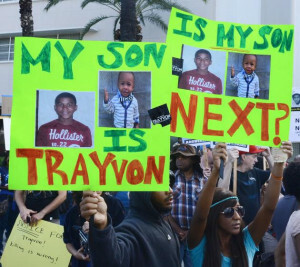 Trayvon Martin’s death sparked a movement. #TrayvonTaughtMe allows us to capture how he and the movement changed all of our lives. #OurSonTrayvon campaign: In collaboration with Gbenga Akkinagbe, founder of Liberated People, and activist-writer Michaela Angela Davis, BLM is supporting the launch of the #OurSonTrayvon campaign, whose goal is to create a sustainable movement humanizing Black children in the collective imagination. Liberated People is donating 15 percent of the proceeds of the #OurSonTrayvon Hoodie to the Trayvon Martin Foundation. #DearTrayvonsMom letter writing campaign: When law enforcement and vigilantes target and kill Black children with impunity, Black parents are stripped of their right to parent their children into adulthood. Remembering Trayvon Martin five years after his murder, Black Lives Matter is soliciting love letters to Sybrina Fulton, Trayvon’s mother. We have commissioned Black artists committed to commemorating Trayvon’s life and the movement he catalyzed, and we will present the love letter to Sybrina in the form of an art installation on Mother’s Day. 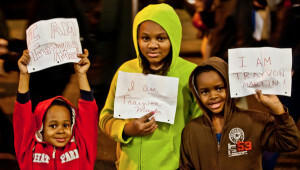 Use #DearTrayvonsMom on any social sharing site and share your love with Sybrina on and ask your network to do the same. #TalkAboutTrayvon digital toolkit and campaign: In partnership with Showing Up for Racial Justice (SURJ), we share the #TalkAboutTrayvon toolkit to launch a conversation among white people about the conditions that led to the extrajudicial murder of Trayvon Martin and the acquittal of George Zimmerman. White communities are used to consciously and unconsciously maintaining the racist policies and practices that led to Travyon’s death and the time is now to have courageous conversations with friends and family members about who Trayvon Martin was and why he’s dead. If Trayvon Martin didn’t attack George Zimmerman, he’d be alive today. George Zimmerman attacked Trayvon and killed him. That’s not what the pictures proved. GZ had a gash on the back of his head. He may have been observing TM, but that’s not illegal. If GZ had his gun with him, why would he roll around on the ground with an over 6′ football player like TM? Why not just shoot him right away? Why did NBC edit audio to make it sound racist? More than that, why was GZ found not guilty?